A Mediterranean-style diet with supplemental extra-virgin olive oil seemed to reduce the incidence of breast cancer in a Spanish population. This is consistent with prior observational studies that link the Mediterranean diet with lower rates of breast and other cancers. The study population involved 4,000 women who were followed for five years. Thirty-five new cases of breast cancer occurred in this PREDIMED study sub-analysis. The comparison diets were a reduced-fat diet and Mediterranean diet supplemented with mixed nuts. This is a relatively small study, so results may not be entirely reliable. If you’re a woman hoping to avoid breast cancer, consider the Mediterranean diet and be sure to eat plenty of extra-virgin olive oil. A good way to do this is to use home-made vinaigrettes. PS: Even if you think Spaniards are jovial, you won’t find any in my books. Cashews fresh off the tree. They’re actually fruits, not nuts. Most of the diets I recommend to my patients include nuts because they are so often linked to improved cardiovascular health in scientific studies. Walnuts are associated with reduced risk of type 2 diabetes in women, and established type 2 diabetics see improved blood sugar control and lower cholesterols when adding nuts to their diets. I recommend nuts to all of my patients. They help reduce risk of coronary artery disease (e.g., heart attacks) and overall risk of death. Don’t believe me? Check this out. Nuts are integral to the Advanced Mediterranean Diet, Ketogenic Mediterranean Diet, Low-Carb Mediterranean Diet, and the Paleobetic Diet. What’s a Good Plant Source of Omega-3 Fatty Acid? Posted on March 22, 2014 | Comments Off on What’s a Good Plant Source of Omega-3 Fatty Acid? David Mendosa says the answer is the macadamia nut. 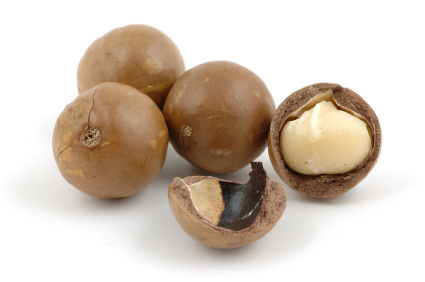 The macadamia nut is that it’s one of the few nuts with a good omega-6/omega-3 fatty acid ratio. In other words, it’s high in omega-3 and low in 6. This may have important cardiovascular health implications. Macadamias are one of the nuts I recommend on my Paleobetic Diet. All of the diets I recommend to my patients include nuts. I just wish macadamias were less expensive. 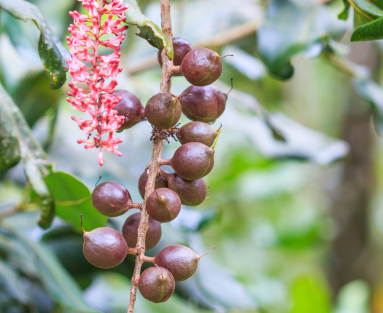 The first Australian macadamia plantation didn’t begin until the 1880s. And not until 1954 with the introduction of mechanised processing did commercial production became viable. Nowadays about 90 percent of the the world’s macadamia nut production comes from Hawaii, where it has become its third most important crop, according to The Wellness Encyclopedia of Food and Nutrition, University of California at Berkeley (1992). Read the rest, where you’ll learn that macadamia nuts are the highest of all nuts in calories, gram for gram. Comments Off on What’s a Good Plant Source of Omega-3 Fatty Acid? Well, perhaps that’s a bit of an overstatement. Preserved brain function and the Mediterranean diet were positively associated in a study involving Americans in Utah. This fits with prior observations that the Mediterranean diet prevents dementia. Higher levels of accordance [compliance] with both the DASH and Mediterranean dietary patterns were associated with consistently higher levels of cognitive function in elderly men and women over an 11-year period. Whole grains and nuts and legumes were positively associated with higher cognitive functions and may be core neuroprotective foods common to various healthy plant-centered diets around the globe. See the American Journal of Clinical Nutrition for details. Why Are Nuts So Prominent in My Diet Plans? Posted on November 26, 2013 | Comments Off on Why Are Nuts So Prominent in My Diet Plans? Walnuts seem to have the lowest omega-6/omega-3 fatty acid ratio of all the common nuts. That may make them the healthiest nut. The jury is still out. Paleo dieters focus on cutting out omega-6s and increasing omega-3s. Julianne Taylor has a great post on how to do that with a variety of foods, not just nuts. Comments Off on Why Are Nuts So Prominent in My Diet Plans? Posted on August 23, 2013 | Comments Off on Where Do Cashews Come From? Comments Off on Where Do Cashews Come From?